Stunning collage art full of rich color, glorious details, and a sense of wonder—reminiscent of the work of Ezra Jack Keats—illustrate this delightful story celebrating the poetry found in the world around us. What is poetry? Is it glistening morning dew? Spider thinks so. Is it crisp leaves crunching? That’s what Squirrel says. Could it be a cool pond, sun-warmed sand, or moonlight on the grass? Maybe poetry is all of these things, as it is something special for everyone—you just have to take the time to really look and listen. The magical thing is that poetry is in everyone, and Daniel is on his way to discovering a poem of his own after spending time with his animal friends. What is poetry? If you look and listen, it’s all around you! 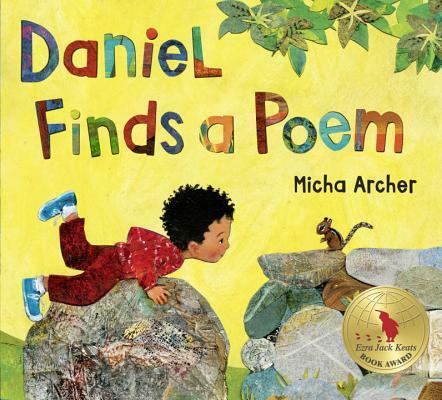 Micha Archer (www.artmicha.com) has illustrated The Wise Fool and Lola’s Fandango, and Daniel Finds a Poem is the first book she’s also written. Working in collage and oil, her use of color and pattern is influenced by the folk art, crafts, and architecture of the countries she has visited and lived in. She realized the importance of the book as a teaching tool after teaching kindergarten and raising two children. Micha divides her time between Costa Rica and western Massachusetts, where she lives in the house she and her husband built, surrounded by gardens and forest to roam in.